When I was younger every Friday my dad made dinner. My favorite Friday dinner was when he made Peas and Macaroni. I enjoyed watching him make it (he always seemed happy). I also enjoyed eating it, lots of it!! I know this was a meal he had when he was growing up. This is another “Depression” food but as far as I am concerned it is definitely not depressing! 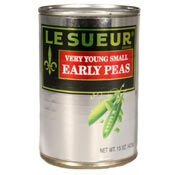 One thing though, my mom always bought the LeSeur brand canned peas. I also still buy the same peas. Sometimes I will use frozen peas and a can of chicken broth. It just doesn’t seem the same. When I make this meal all I can think of is my dad getting home from work on a Friday night, having a beer in the breezeway sitting on the steps, then coming in the kitchen and making the most delicious meal for all of us. Don’t knock it until you have tried it! 1. Cook pasta according to directions on box. 2. While pasta is cooking add 2 Tablespoons olive oil to fry pan over medium heat. Add sliced onions and peppers. Cook until onion opaque, about 8-10 minutes. 3. Add garlic, oregano and basil. Stir together. 4. Add 2 cans of peas. Cook over medium heat until warmed through, about 5 minutes. 5. In the meantime drain pasta in colander, then put back in sauce pan. 6. When peas are heated through add to the pasta. Mix the pasta and peas together.